Medium-sized, elegant and square in build, the German Pinscher is an excellent watchdog and companion. 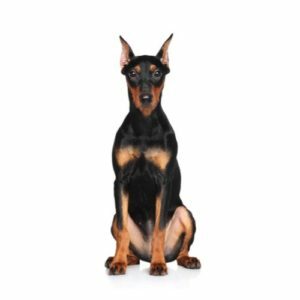 Bigger than the Miniature Pinscher but smaller than the Doberman, the agility, alertness, intelligence and stamina of the German Pinscher make it suitable for conformation, obedience, tracking, agility competitions and more. Their short coats can be black, blue, brown, fawn or red; some have red or tan markings. Originally from Germany, the German Pinscher was prized for his vermin hunting ability. Despite his name, the German Pinscher is more closely related to the Schnauzer than the Doberman or Miniature Pinscher. Like many breeds, the German Pinscher approached extinction at the end of the World Wars, but interested owner Werner Jung revived the breed. A working dog, German Pinschers possess a natural instinct to hunt vermin and protect home and family. This creates a dog with strong prey drive and a strong will. However, they are willing learners and they make wonderful multipurpose companions with firm but gentle and consistent discipline. A high-energy breed, they enjoy activities with their owners and require daily exercise. Their smaller size makes them suitable for city or country life, but they enjoy having a yard in which to run. The breed?۪s short coat needs little maintenance. Working Group; AKC recognized in 2003. Ideal size: 17-20 inches tall at the highest point of the withers. Are you interested in purchasing a German Pinscher?